SIMOLW506TQ is the 3-in-1 Universal Sprint SIM Card contained in Sprint ISIM-KIT-v2 SIM Activation Kits. The Sprint SIMOLW506TQ SIM Cards (SKU: CZ410PTLWQ) is an OBR MULTIPUNCH SMOTA ISIM SIM Card that is currently used with many Sprint devices including the Samsung Galaxy Note 8 (Special Edtion) and the iPhone X. 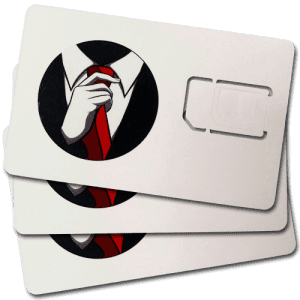 Offering a multi-punch SIM Card tray gives the SIM Card (SKU: CZ410PTLWQ) much broader compatibility than a normal Sprint SIM Card with only one SIM Card tray/form factor. This SIM Card is predicted to be used in many future Sprint BYOD (bring your own device) handsets. Sprint calls this SIM Card universally compatible, although we advise checking the compatibility list below to confirm your device is compatible. Keep in mind, these 854798005170 Sprint SIM Cards are reusable like all Sprint UICCs. SIMOLW506TQ SIM Cards are some of the only multi-punch SIM Cards Sprint has manufactured. Of over 40 SIM Cards made by Sprint, this appears to offer much wider compatibility. As the list above shows, it is supposed to be compatible with over 30 different devices from 7 separate manufactures. However, please be aware that this card is often mistaken for another SIM card. To verify compatibility, search the UICC Database for your device before ordering.